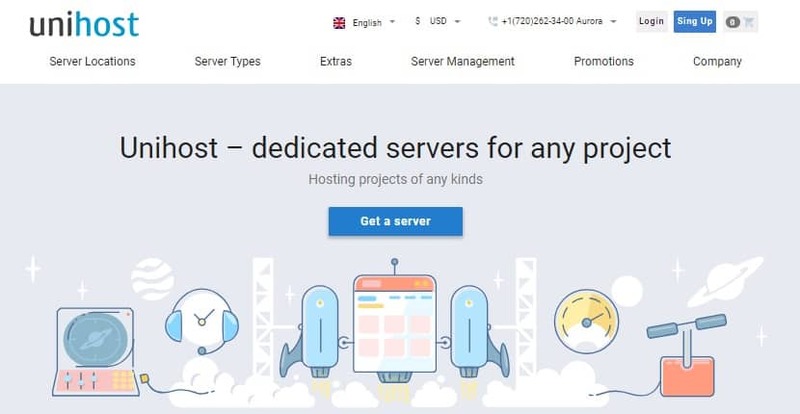 Unihost Review 2019: Is Unihost a Good Hosting? With robust dedicated servers optimized for performance, Unihost provides a variety of server configurations and hosting packages. The company has strong partnerships with Microsoft, Vmware, CloudLinux, Dell, Intel, cPanel, Oracle, Comodo, and ISP. Unihost is a privately-owned company that offers a range of web hosting, VPS, and dedicated server solutions to individuals and businesses. Currently, Unihost maintains servers in Europe and Canada. The company’s website is available in English, Ukrainian, and Russian. With servers around the world, Unihost can take care of all your local and international hosting needs. They operate Tier-3 and Tier-4 data centers with over 130 configurations and backup systems. Depending on your needs, you can order budget hosting solutions for starter websites or powerful dedicated servers with Intel Xeon processors for heavy workloads. With the latter, you get dedicated IPs for your project and ample space up to 13 TB on RAID 10 array with multiple nodes. That’s more than enough space to host your databases, media portal, streaming services, and enterprise apps, or online store. Unihost can be a great choice if you’re also looking for a hosting service that provides free backup storage to customers. With every dedicated server, you get 100-500 GB of external backup. The amount of storage space varies from location to location. Basic server management set up is 100% free. With a powerful and flexible server management area, you’ll have an easy time allocating virtual resources to workloads. You can conveniently manage your web space, reboot, install an OS of your choice, and monitor network stats right from your account dashboard. In case you want to migrate from your current host to Unihost, you may want to take advantage of their free and fast project transfers. Their support team will help you move your files, databases, or apps to their servers. Just shoot them an email with a detailed description of the intended project transfer. Unihost has flexible packages with zero setup fees. You can choose a server based on RAM, IPs per server, disk types, location, cores, and price. When you place an order, you can pay monthly, quarterly, semi-annually, or annually. I recommend that you go for the 6-month billing cycle or a yearly plan. Both qualify you for discounts between 2.5-5%. They also offer a good number of add-ons to customers who sign up for dedicated servers. Having looked around, I can tell you that they don’t have free trials. I guess it’s because they offer a number discounts and seasonal deals. Switching up or downgrading plans is a simple thing. With a few clicks, you can upgrade and get more storage space and RAM to match your growing workloads. Customers enjoy round the clock support via live chat, email, telephone, Skype, and even Telegram. The support knows their stuff. If you have complex issues, it’s advisable that you open a high-priority ticket so that the support team can help you and resolve it quickly. You may also order premium management packages with active monitoring and troubleshooting. Unihost offers solid hosting service at affordable prices and good uptime across all their plans. Add to that the great support team, and you will see why customers flock their platform day and night. Wondering how Unihost stacks up against other Web Hosting companies? Enter any other Web Hosting company and we will give you a side-by-side comparison.